Satellite data from NASA revealed that powerful storms in Super Typhoon Meranti were generating almost a foot or almost 300 millimeters of rainfall per hour. The Global Precipitation Measurement mission or GPM core satellite measured the heavy rainfall on one side of the Category 5 super typhoon. A tropical depression that formed northwest of Guam on Sept. 9, 2016 became Typhoon Meranti on Sunday, Sept. 11. Meranti has been traveling toward the northwest over warm water and low vertical wind shear. These favorable environmental conditions helped Typhoon Meranti undergo rapid intensification. Typhoon Meranti was on its way to become a super typhoon when the GPM core observatory satellite flew over on Sept. 12, 2016 at 0206 UTC (Sept. 11 at 10:06 p.m. EDT). Meranti's winds had increased to about 115 knots (132 mph). 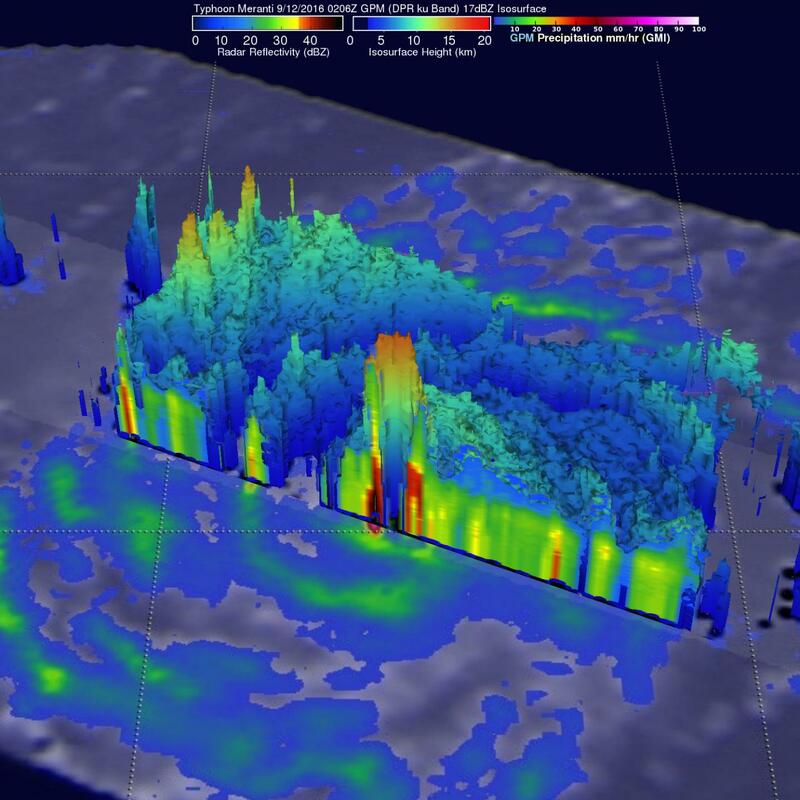 Data from GPM's Microwave Imager (GMI) and Dual-Frequency Precipitation Radar (DPR) instruments showed that typhoon Meranti had multiple rain bands spiraling around a small well defined eye. Estimates from DPR data indicated that rain was falling at a rate of over 299 mm (11.8 inches) per hour in powerful storms in the northeastern side of Meranti's eye wall. GPM found very tall towering thunderstorms in typhoon Meranti's eye wall as the satellite's radar (DPR Ku Band) made 3-D measurements of precipitation through the center of the typhoon. Some of these "hot towers" were found by DPR to reach heights of over 10.5 miles (17 kilometers). Rainfall within these powerful storms supplied energy that aided in typhoon Meranti's intensification. GPM is a joint mission between NASA and the Japan Aerospace Exploration Agency JAXA. A "hot tower" is a tall cumulonimbus cloud near the center of a tropical cyclone, often seen prior to intensification. The cloud tops reach at least to the top of the troposphere, the lowest layer of the atmosphere which is approximately 9 miles/14.5 km high in the tropics. These towers are called "hot" because they rise to such altitude due to the large amount of latent heat. Water vapor releases this latent heat as it condenses into liquid. Those towering thunderstorms have the potential for heavy rain. Energy released by rainfall into the center of a tropical cyclone provides the energy upon which tropical cyclones thrive. Warnings are in effect today, Sept. 12 in the Philippines. Philippines warnings include Public storm warning signal #2 in the Luzon provinces of Batanes and Babuyan group of islands. In addition, Public storm warning signal #1 is raised in the Luzon provinces of Rest of Cagayan, northern Isabela, Kalinga, Apayao, Abra, Ilocos Norte. In addition, typhoon warnings are in effect in Taiwan. The Taiwan Central Weather Bureau is posting updated warnings and forecast tracks on their website: http://www.cwb.gov.tw/V7e/prevent/warning/I10big.htm. On Monday, Sept. 12, Super Typhoon Meranti had maximum sustained winds near 178.4 mph (155 knots/287.1 kph) making it a Category 5 hurricane on the Saffir-Simpson Hurricane Wind Scale. Meranti was located about 457 nautical miles south of Kadena Air Base, Okinawa, Japan, near 18.9 degrees north latitude and 128.2 degrees east longitude. Meranti was moving to the west-northwest at 13.8 mph (12 knots/22.2 kph) and generating waves up to 47 feet (14.3 meters) high. The Joint Typhoon Warning Center (JTWC) predicts that Super Typhoon Meranti's winds will decrease slightly before hitting southern Taiwan in a couple days. Southern Taiwan is expected to experience the full impact of Super Typhoon Mercanti as the eye passes over that area.